I need the right way to smoke a turkey step by step. A turkey around 12 to 15 lbs. General section maybe since this is not a recipe. Smoking a turkey can be pretty simple really. This is what works for us. Normally, we prefer fresh, but found frozen turkeys came out better. Frozen turkeys gonna come with a 8-12% solution (brine), so we don't do anything else to it. Rub oil on it prior to placing in the cooker, cook at about 240-250� 4-5 hours, (usually when the pop-up timer pops up). Here are some basics that will work for you, from Smokin' Okie. If the turkey has an 8% solution, if it has a sodium additive or some chemical you cannot pronounce in it then there will be no benefit in brining it. If the solution is only water that has been injected, then you can go ahead and brine it. There are a lot of good brining recipes around so I wont get into them. 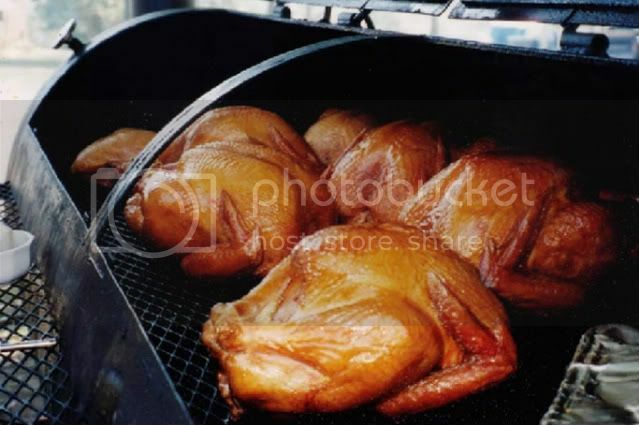 I try to smoke whole poultry at the highest temperature my smoker will allow; which usually is 230-250�F. I bring the internal meat temperature to 160�F, measured at the thigh. It will usually rise to 165�F will it is resting. As for time, depending on how much moisture is in the skin you may be looking at 5-7 hours of smoking/cooking times. I only apply 2-3 hours of smoke, and lately have been using pecan or maple on poultry. If you are running short on time, you can always finish it off in the oven at a higher temperature. I have 2 21 lb turkeys I would like to smoke along with pork shoulder and brisket for this weekend. Is a 21lb turkey too big for smoking? Will the breast dry out before the rest is cooked?